Download "ICP-CC488. 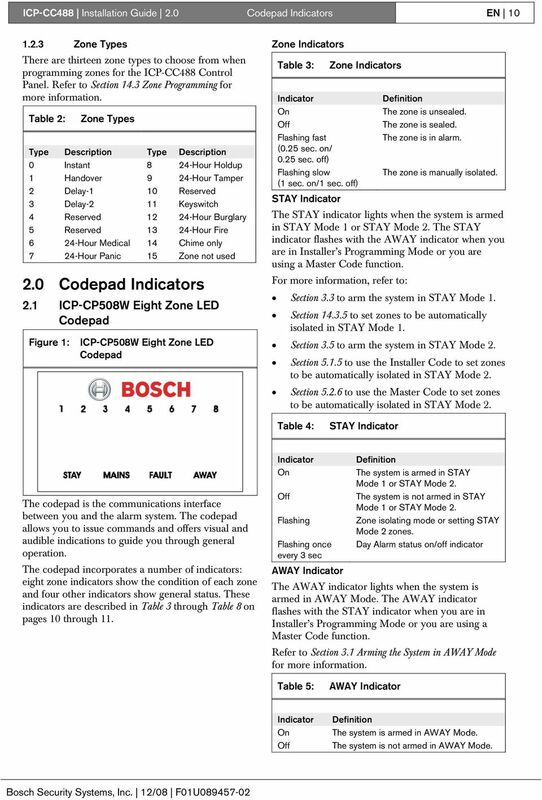 Installation Guide ICP-CC488 Control Panel"
2 ICP-CC488 Installation Guide Notices EN 2 Copyright Notice Unless otherwise indicated, this publication is the copyright of Bosch Security Systems, Inc. ( Bosch ). All rights are reserved. You may download a single copy of this publication. By downloading the publication you agree that you will: (i) only use the publication for your own reference; (ii) not commercially exploit or charge any person for the use of the publication; and (iii) not modify the publication in any way without the prior written permission of Bosch. Except as specified above or where authorized by the Copyright Act 1968 (Cth), no part of this publication may be reproduced, transmitted, modified or stored, in any form or by any means, without the prior written permission of Bosch. Notice of Liability This material is designed for use by tradespeople with expertise in the installation of this product. Persons without appropriate expertise should seek assistance before attempting installation. While care has been taken in the preparation of this material, Bosch Security Systems, Inc. and its representatives will not be responsible to any person or entity for any loss or damage directly or indirectly caused by information in, or any omission from, this material. 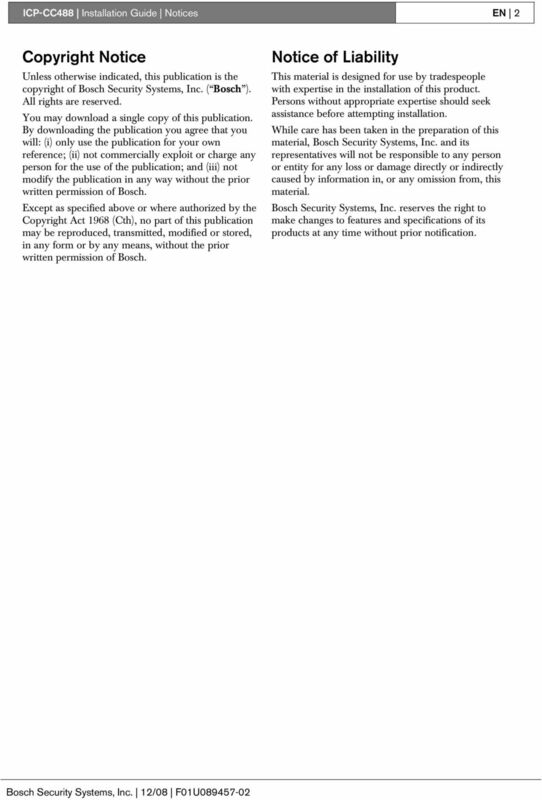 Bosch Security Systems, Inc. reserves the right to make changes to features and specifications of its products at any time without prior notification. 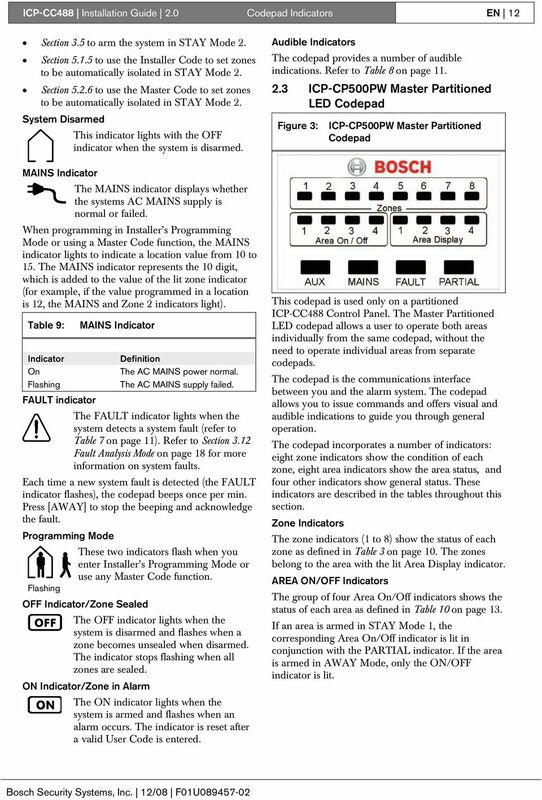 10 ICP-CC488 Installation Guide 2.0 Codepad Indicators EN Zone Types There are thirteen zone types to choose from when programming zones for the ICP-CC488 Control Panel. Refer to Section 14.3 Zone Programming for more information. 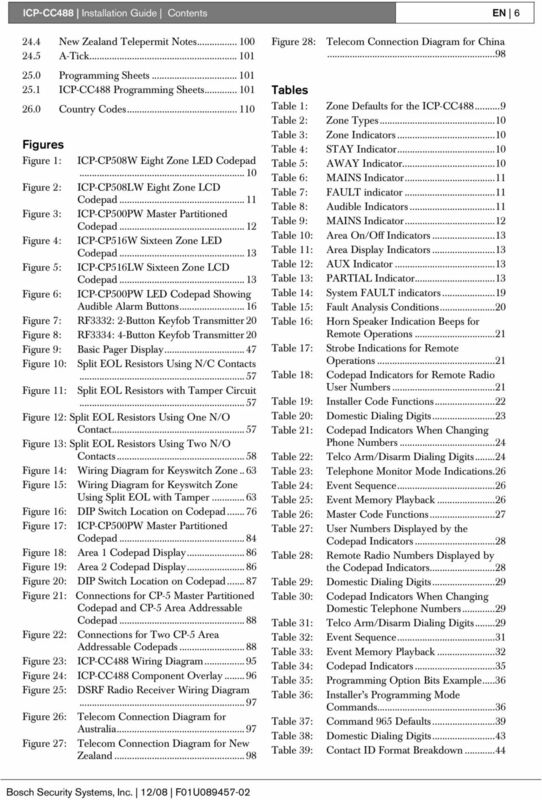 Table 2: Zone Types Type Description Type Description 0 Instant 8 24-Hour Holdup 1 Handover 9 24-Hour Tamper 2 Delay-1 10 Reserved 3 Delay-2 11 Keyswitch 4 Reserved Hour Burglary 5 Reserved Hour Fire 6 24-Hour Medical 14 Chime only 7 24-Hour Panic 15 Zone not used 2.0 Codepad Indicators 2.1 ICP-CP508W Eight Zone LED Codepad Figure 1: ICP-CP508W Eight Zone LED Codepad Zone Indicators Table 3: Indicator On Off Flashing fast (0.25 sec. on/ 0.25 sec. off) Flashing slow (1 sec. on/1 sec. off) Zone Indicators Definition The zone is unsealed. The zone is sealed. The zone is in alarm. The zone is manually isolated. STAY Indicator The STAY indicator lights when the system is armed in STAY Mode 1 or STAY Mode 2. The STAY indicator flashes with the AWAY indicator when you are in Installer s Programming Mode or you are using a Master Code function. For more information, refer to: Section 3.3 to arm the system in STAY Mode 1. Section to set zones to be automatically isolated in STAY Mode 1. Section 3.5 to arm the system in STAY Mode 2. Section to use the Installer Code to set zones to be automatically isolated in STAY Mode 2. Section to use the Master Code to set zones to be automatically isolated in STAY Mode 2. Table 4: STAY Indicator The codepad is the communications interface between you and the alarm system. The codepad allows you to issue commands and offers visual and audible indications to guide you through general operation. The codepad incorporates a number of indicators: eight zone indicators show the condition of each zone and four other indicators show general status. These indicators are described in Table 3 through Table 8 on pages 10 through 11. Indicator On Off Flashing Flashing once every 3 sec Definition The system is armed in STAY Mode 1 or STAY Mode 2. 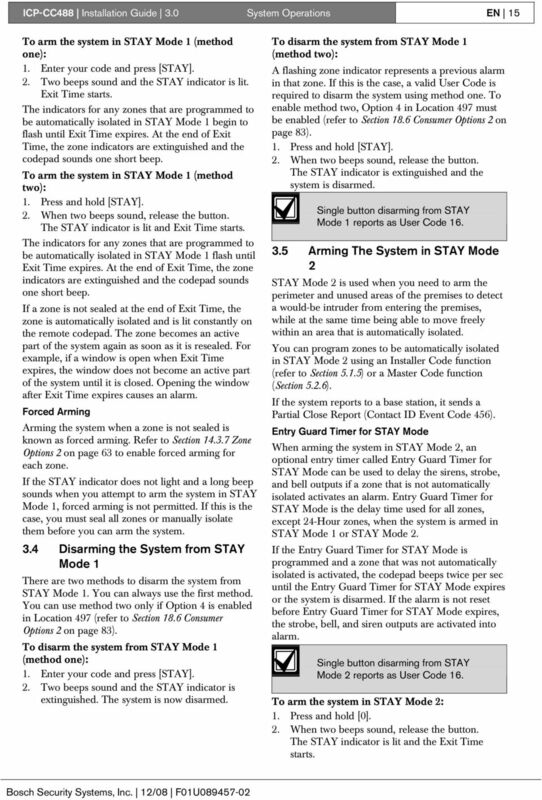 The system is not armed in STAY Mode 1 or STAY Mode 2. Zone isolating mode or setting STAY Mode 2 zones. Day Alarm status on/off indicator AWAY Indicator The AWAY indicator lights when the system is armed in AWAY Mode. The AWAY indicator flashes with the STAY indicator when you are in Installer s Programming Mode or you are using a Master Code function. Refer to Section 3.1 Arming the System in AWAY Mode for more information. Table 5: AWAY Indicator Indicator On Off Definition The system is armed in AWAY Mode. The system is not armed in AWAY Mode. 11 ICP-CC488 Installation Guide 2.0 Codepad Indicators EN 11 MAINS Indicator The MAINS indicator displays whether the system s AC MAINS supply is normal or failed. When programming in Installer s Programming Mode or using a Master Code function, the MAINS indicator lights to indicate a location value from 10 to 15. The MAINS indicator represents the 10 digit, which is added to the value of the lit zone indicator (for example, if the value programmed in a location is 12, the MAINS and Zone 2 indicators light). 2.2 ICP-CP508LW Eight Zone LCD Codepad Figure 2: ICP-CP508LW Eight Zone LCD Codepad Table 6: MAINS Indicator Indicator Definition On The AC MAINS power is normal. Flashing The AC MAINS supply failed. FAULT indicator The FAULT indicator lights when the system detects a system fault. Refer to Section 3.12 Fault Analysis Mode on page 18 for more information on system faults. Each time a new system fault is detected (the FAULT indicator flashes), the codepad beeps once per min. Press [AWAY] to stop the beeping and to acknowledge the fault. Table 7: FAULT indicator Indicator Definition On A system fault must be corrected. Off The system is normal (no faults). Flashing A system fault must be acknowledged. Audible Indicators The codepad provides these audible indications: Table 8: Audible Indicator One short beep Two short beeps Three short beeps One long beep One short beep every sec One short beep every 2 sec One short beep every min Audible Indicators Definition A button was pressed on the codepad, or Exit Time ended when arming in STAY Mode 1 or STAY Mode 2. The system accepted your code. The system executed the requested function. Exit Time ended when arming in AWAY Mode, or the requested operation was denied or aborted. Walk Test Mode is currently active, or warning before automatic arming takes place. Telephone Monitor Mode is active. There is a system fault to be acknowledged. The codepad is the communications interface between you and the alarm system. The codepad allows you to issue commands and offers visual and audible indications to guide you through general operation. The codepad incorporates a number of indicators: eight zone indicators show the condition of each zone and seven other indicators show general status. These indicators are described in the tables throughout this section. Zone Indicators The zone indicators (1 to 8) display the status of the zones listed in Table 3 on page 10. AWAY Indicator The AWAY indicator lights when the system is armed in AWAY Mode. The ON indicator also lights when the system is armed in AWAY Mode (refer to Table 5 on page 10). The AWAY indicator flashes with the STAY indicator when you are in Installer s Programming Mode or you are using a Master Code function. Refer to Section 3.1 Arming the System in AWAY Mode for more information. STAY Indicator The STAY indicator lights when the system is armed in STAY Mode 1 or STAY Mode 2 (refer to Table 4). The STAY indicator also flashes with the AWAY indicator when you are in Installer s Programming Mode or you are using a Master Code function. The ON indicator also lights when the system is armed in STAY Mode 1 or STAY Mode 2. For more information, refer to: Section 3.3 to arm the system in STAY Mode 1. Section to set zones to be automatically isolated in STAY Mode 1. 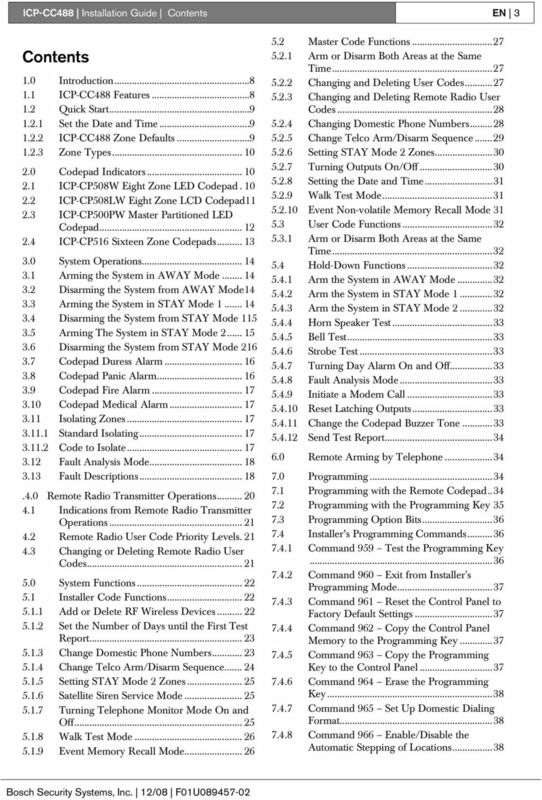 12 ICP-CC488 Installation Guide 2.0 Codepad Indicators EN 12 Section 3.5 to arm the system in STAY Mode 2. Section to use the Installer Code to set zones to be automatically isolated in STAY Mode 2. 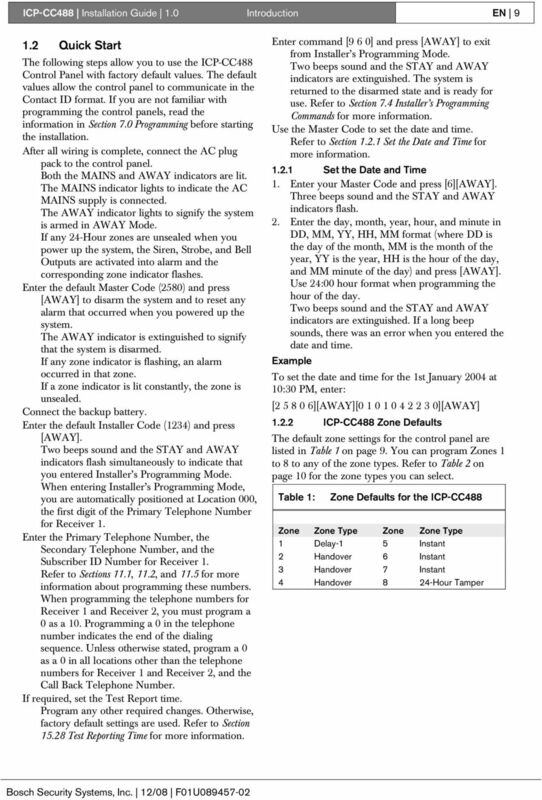 Section to use the Master Code to set zones to be automatically isolated in STAY Mode 2. System Disarmed This indicator lights with the OFF indicator when the system is disarmed. Audible Indicators The codepad provides a number of audible indications. Refer to Table 8 on page ICP-CP500PW Master Partitioned LED Codepad Figure 3: ICP-CP500PW Master Partitioned Codepad MAINS Indicator The MAINS indicator displays whether the systems AC MAINS supply is normal or failed. When programming in Installer s Programming Mode or using a Master Code function, the MAINS indicator lights to indicate a location value from 10 to 15. The MAINS indicator represents the 10 digit, which is added to the value of the lit zone indicator (for example, if the value programmed in a location is 12, the MAINS and Zone 2 indicators light). Table 9: Indicator On Flashing FAULT indicator MAINS Indicator Definition The AC MAINS power normal. The AC MAINS supply failed. 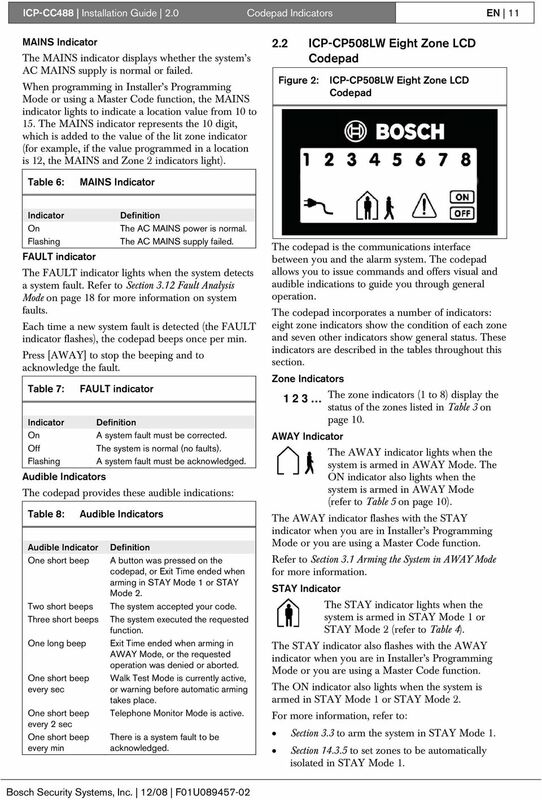 The FAULT indicator lights when the system detects a system fault (refer to Table 7 on page 11). Refer to Section 3.12 Fault Analysis Mode on page 18 for more information on system faults. Each time a new system fault is detected (the FAULT indicator flashes), the codepad beeps once per min. Press [AWAY] to stop the beeping and acknowledge the fault. Programming Mode These two indicators flash when you enter Installer s Programming Mode or use any Master Code function. Flashing OFF Indicator/Zone Sealed The OFF indicator lights when the system is disarmed and flashes when a zone becomes unsealed when disarmed. The indicator stops flashing when all zones are sealed. ON Indicator/Zone in Alarm The ON indicator lights when the system is armed and flashes when an alarm occurs. The indicator is reset after a valid User Code is entered. This codepad is used only on a partitioned ICP-CC488 Control Panel. The Master Partitioned LED codepad allows a user to operate both areas individually from the same codepad, without the need to operate individual areas from separate codepads. The codepad is the communications interface between you and the alarm system. The codepad allows you to issue commands and offers visual and audible indications to guide you through general operation. The codepad incorporates a number of indicators: eight zone indicators show the condition of each zone, eight area indicators show the area status, and four other indicators show general status. These indicators are described in the tables throughout this section. Zone Indicators The zone indicators (1 to 8) show the status of each zone as defined in Table 3 on page 10. The zones belong to the area with the lit Area Display indicator. AREA ON/OFF Indicators The group of four Area On/Off indicators shows the status of each area as defined in Table 10 on page 13. If an area is armed in STAY Mode 1, the corresponding Area On/Off indicator is lit in conjunction with the PARTIAL indicator. If the area is armed in AWAY Mode, only the ON/OFF indicator is lit. 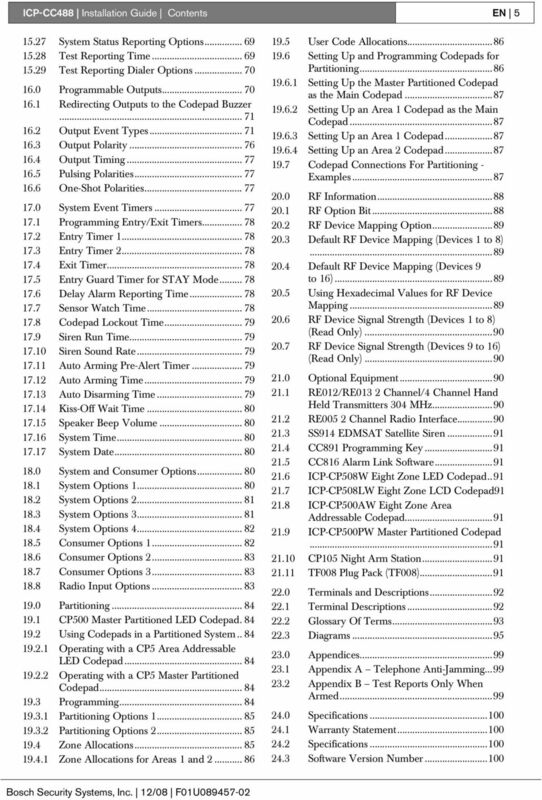 14 ICP-CC488 Installation Guide 3.0 System Operations EN System Operations This section explains the general operations of the system: arming and disarming the system in the three modes, isolating zones, initiating codepad alarms, and determining a fault. 3.1 Arming the System in AWAY Mode Arming the system in AWAY Mode is normally performed when you leave the premises and require that all zones are activated in a ready state to detect an intrusion. There are two different methods to arm the system in AWAY Mode. You can always use method one. You can use method two only if Option 2 is enabled in Location 497 (refer to Section 18.6 Consumer Options 2 on page 83). If you must isolate a zone (or zones) before arming the system in AWAY Mode, refer to Section 3.11 Isolating Zones on page 17. Single button arming in AWAY Mode reports as User Code number 16. To arm the system in AWAY Mode (method one): Enter your code and press [AWAY]. Two beeps sound, the AWAY indicator lights, and Exit Time starts. To arm the system in AWAY Mode (method two): Select Option 2 in Location 497 to enable single button arming in AWAY Mode (refer to Section 18.6 Consumer Options 2 on page 83). 1. Press and hold [AWAY]. 2. When two beeps sound, release the button. The AWAY indicator lights and Exit Time starts. If a zone is not sealed at the end of Exit Time, the zone is automatically isolated and its indicator is lit on the remote codepad. The zone becomes an active part of the system again as soon as it is resealed. For example, if a window is open when Exit Time expires, the window is not an active part of the system until it is closed. Opening the window after Exit Time expires causes an alarm. Forced Arming Arming the system when a zone is not sealed is known as forced arming. 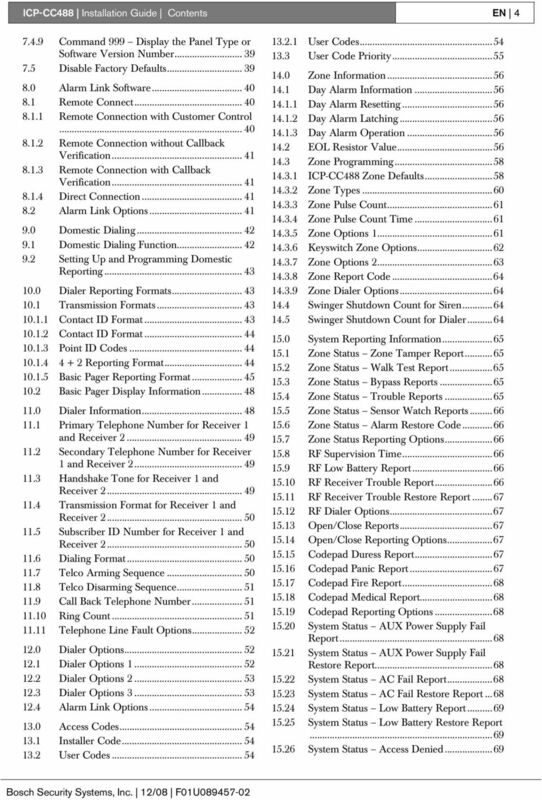 Refer to Section Zone Options 2 on page 63 to enable forced arming for each zone. If the AWAY indicator does not light and a long beep sounds when you attempt to arm the system in AWAY Mode, forced arming is not permitted. If this is the case, you seal all zones or manually isolate them before you can arm the system. 3.2 Disarming the System from AWAY Mode When you enter the premises after the system is armed in AWAY Mode, you must disarm the system from AWAY Mode to disable detection devices that activate the sirens, strobe, and bell outputs. If there was an alarm prior to disarming the system from AWAY Mode, a zone indicator flashes, indicating a previous alarm in that zone. To disarm the system from AWAY Mode: 1. Enter your code and press [AWAY]. 2. Two beeps sound and the AWAY indicator is extinguished. 3.3 Arming the System in STAY Mode 1 STAY Mode 1 is used when you need to arm the perimeter and unused areas of the premises to detect a would-be intruder entering the premises, while at the same time being able to move freely within an area that is automatically isolated. Only the installer can program zones to be automatically isolated in STAY Mode 1. Refer to Section Zone Options 2 on page 63 for more information on setting zones to be automatically isolated in STAY Mode 1. 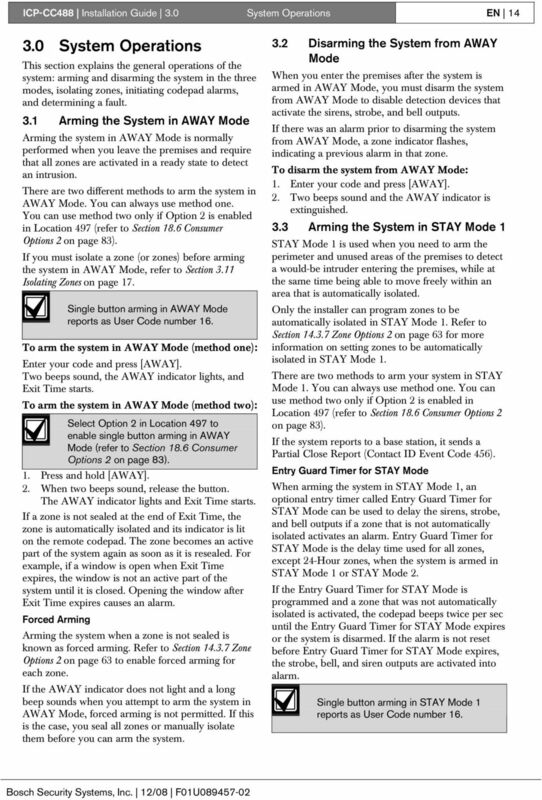 There are two methods to arm your system in STAY Mode 1. You can always use method one. You can use method two only if Option 2 is enabled in Location 497 (refer to Section 18.6 Consumer Options 2 on page 83). If the system reports to a base station, it sends a Partial Close Report (Contact ID Event Code 456). Entry Guard Timer for STAY Mode When arming the system in STAY Mode 1, an optional entry timer called Entry Guard Timer for STAY Mode can be used to delay the sirens, strobe, and bell outputs if a zone that is not automatically isolated activates an alarm. Entry Guard Timer for STAY Mode is the delay time used for all zones, except 24-Hour zones, when the system is armed in STAY Mode 1 or STAY Mode 2. If the Entry Guard Timer for STAY Mode is programmed and a zone that was not automatically isolated is activated, the codepad beeps twice per sec until the Entry Guard Timer for STAY Mode expires or the system is disarmed. If the alarm is not reset before Entry Guard Timer for STAY Mode expires, the strobe, bell, and siren outputs are activated into alarm. Single button arming in STAY Mode 1 reports as User Code number 16. 15 ICP-CC488 Installation Guide 3.0 System Operations EN 15 To arm the system in STAY Mode 1 (method one): 1. Enter your code and press [STAY]. 2. Two beeps sound and the STAY indicator is lit. Exit Time starts. The indicators for any zones that are programmed to be automatically isolated in STAY Mode 1 begin to flash until Exit Time expires. At the end of Exit Time, the zone indicators are extinguished and the codepad sounds one short beep. To arm the system in STAY Mode 1 (method two): 1. Press and hold [STAY]. 2. When two beeps sound, release the button. The STAY indicator is lit and Exit Time starts. The indicators for any zones that are programmed to be automatically isolated in STAY Mode 1 flash until Exit Time expires. At the end of Exit Time, the zone indicators are extinguished and the codepad sounds one short beep. If a zone is not sealed at the end of Exit Time, the zone is automatically isolated and is lit constantly on the remote codepad. The zone becomes an active part of the system again as soon as it is resealed. For example, if a window is open when Exit Time expires, the window does not become an active part of the system until it is closed. Opening the window after Exit Time expires causes an alarm. Forced Arming Arming the system when a zone is not sealed is known as forced arming. Refer to Section Zone Options 2 on page 63 to enable forced arming for each zone. If the STAY indicator does not light and a long beep sounds when you attempt to arm the system in STAY Mode 1, forced arming is not permitted. If this is the case, you must seal all zones or manually isolate them before you can arm the system. 3.4 Disarming the System from STAY Mode 1 There are two methods to disarm the system from STAY Mode 1. You can always use the first method. You can use method two only if Option 4 is enabled in Location 497 (refer to Section 18.6 Consumer Options 2 on page 83). To disarm the system from STAY Mode 1 (method one): 1. Enter your code and press [STAY]. 2. Two beeps sound and the STAY indicator is extinguished. The system is now disarmed. To disarm the system from STAY Mode 1 (method two): A flashing zone indicator represents a previous alarm in that zone. If this is the case, a valid User Code is required to disarm the system using method one. To enable method two, Option 4 in Location 497 must be enabled (refer to Section 18.6 Consumer Options 2 on page 83). 1. Press and hold [STAY]. 2. When two beeps sound, release the button. The STAY indicator is extinguished and the system is disarmed. Single button disarming from STAY Mode 1 reports as User Code Arming The System in STAY Mode 2 STAY Mode 2 is used when you need to arm the perimeter and unused areas of the premises to detect a would-be intruder from entering the premises, while at the same time being able to move freely within an area that is automatically isolated. You can program zones to be automatically isolated in STAY Mode 2 using an Installer Code function (refer to Section 5.1.5) or a Master Code function (Section 5.2.6). If the system reports to a base station, it sends a Partial Close Report (Contact ID Event Code 456). Entry Guard Timer for STAY Mode When arming the system in STAY Mode 2, an optional entry timer called Entry Guard Timer for STAY Mode can be used to delay the sirens, strobe, and bell outputs if a zone that is not automatically isolated activates an alarm. Entry Guard Timer for STAY Mode is the delay time used for all zones, except 24-Hour zones, when the system is armed in STAY Mode 1 or STAY Mode 2. If the Entry Guard Timer for STAY Mode is programmed and a zone that was not automatically isolated is activated, the codepad beeps twice per sec until the Entry Guard Timer for STAY Mode expires or the system is disarmed. If the alarm is not reset before Entry Guard Timer for STAY Mode expires, the strobe, bell, and siren outputs are activated into alarm. Single button disarming from STAY Mode 2 reports as User Code 16. To arm the system in STAY Mode 2: 1. Press and hold . 2. When two beeps sound, release the button. The STAY indicator is lit and the Exit Time starts. 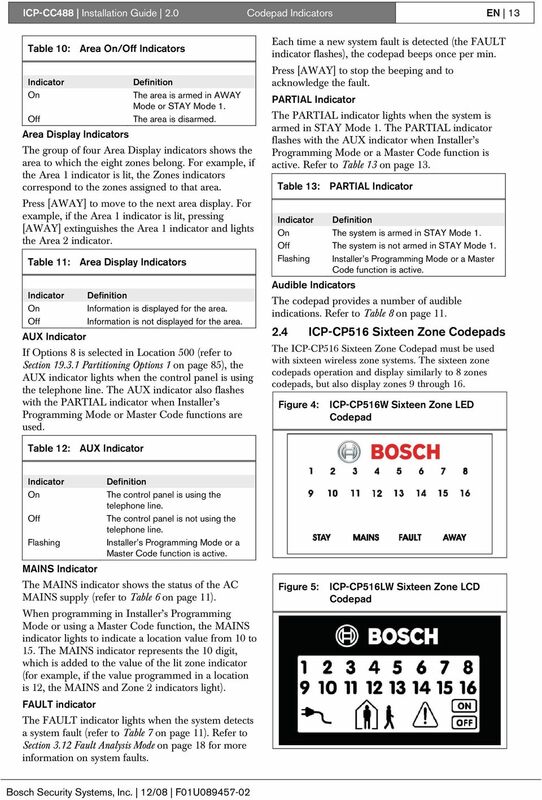 16 ICP-CC488 Installation Guide 3.0 System Operations EN 16 The indicators for any zones that are programmed to be automatically isolated in STAY Mode 2 flash until the Exit Time expires. At the end of Exit Time, the zone indicators are extinguished and the codepad sounds one short beep. If a zone is not sealed at the end of Exit Time, the zone is automatically isolated and is lit constantly on the remote codepad. The zone becomes an active part of the system again as soon as it is resealed. For example, if a window is open when Exit Time expires, the window does not become an active part of the system until it is closed. Opening the window after Exit Time expires causes an alarm. Forced Arming Arming the system when a zone is not sealed is known as forced arming. 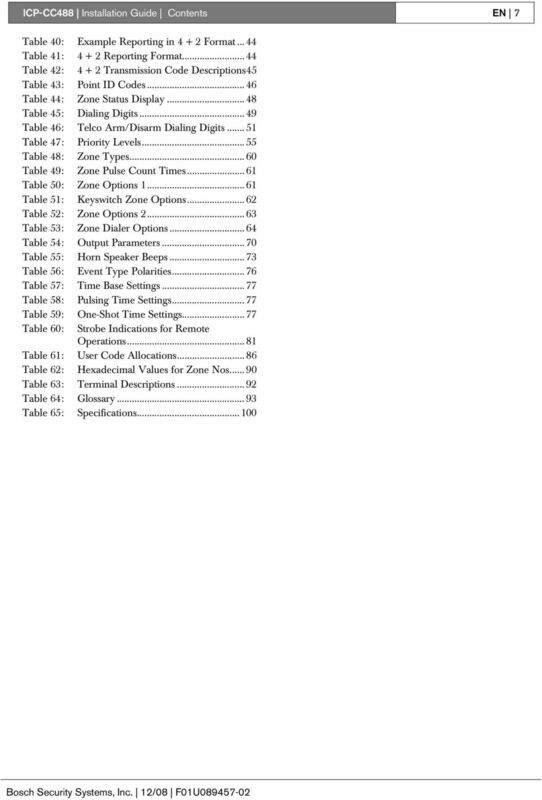 Refer to Section Zone Options 2 on page 63 to enable forced arming for each zone. If the STAY indicator does not light and a long beep sounds when attempting to arm the system, forced arming is not permitted. If this is the case, you must seal all zones or manually isolate them before you can arm the system. 3.6 Disarming the System from STAY Mode 2 There are two methods to disarm the system from STAY Mode 2. You can always use the first method. You can use method two only if Option 4 is enabled in Location 497 (refer to Section 18.6 Consumer Options 2 on page 83). To disarm the system from STAY Mode 2 (method one): 1. Enter your code and press [STAY]. 2. Two beeps sound and the STAY indicator is extinguished. The system is now disarmed. To disarm the system from STAY Mode 2 (method two): A flashing zone indicator represents a previous alarm in that zone. If this is the case, a valid User Code is required to disarm the system using method one. To enable method two, Option 4 in Location 497 must be enabled (refer to Section 18.6 Consumer Options 2 on page 83). 1. Press and hold . 2. When two beeps sound, release the button. The STAY indicator is extinguished and the system is disarmed. 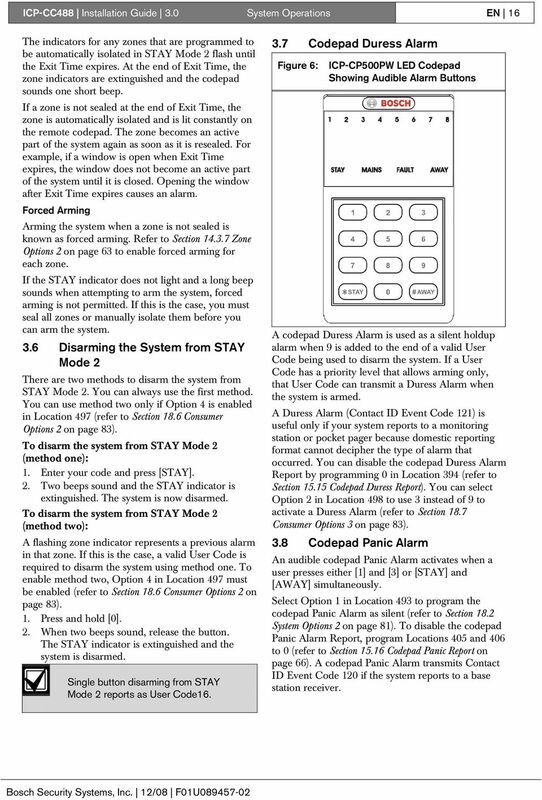 Single button disarming from STAY Mode 2 reports as User Code Codepad Duress Alarm Figure 6: ICP-CP500PW LED Codepad Showing Audible Alarm Buttons A codepad Duress Alarm is used as a silent holdup alarm when 9 is added to the end of a valid User Code being used to disarm the system. If a User Code has a priority level that allows arming only, that User Code can transmit a Duress Alarm when the system is armed. A Duress Alarm (Contact ID Event Code 121) is useful only if your system reports to a monitoring station or pocket pager because domestic reporting format cannot decipher the type of alarm that occurred. You can disable the codepad Duress Alarm Report by programming 0 in Location 394 (refer to Section Codepad Duress Report). You can select Option 2 in Location 498 to use 3 instead of 9 to activate a Duress Alarm (refer to Section 18.7 Consumer Options 3 on page 83). 3.8 Codepad Panic Alarm An audible codepad Panic Alarm activates when a user presses either  and  or [STAY] and [AWAY] simultaneously. 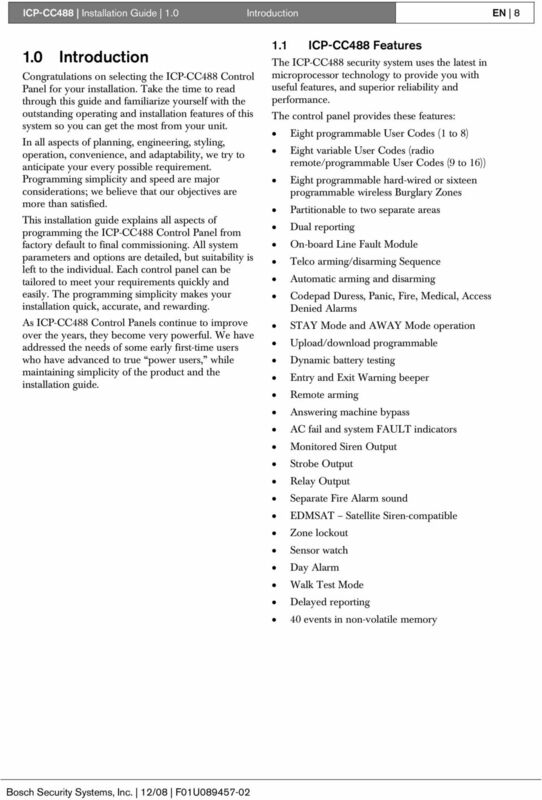 Select Option 1 in Location 493 to program the codepad Panic Alarm as silent (refer to Section 18.2 System Options 2 on page 81). To disable the codepad Panic Alarm Report, program Locations 405 and 406 to 0 (refer to Section Codepad Panic Report on page 66). A codepad Panic Alarm transmits Contact ID Event Code 120 if the system reports to a base station receiver. 17 ICP-CC488 Installation Guide 3.0 System Operations EN Codepad Fire Alarm An audible codepad Fire Alarm activates when a user presses  and  on the remote codepad simultaneously. A distinct fire sound emits through the horn speaker to indicate this type of alarm. The fire sound is different than the burglary sound. Select Option 2 in Location 493 to program the codepad Fire Alarm as silent (refer to Section 18.2 System Options 2 on page 81). To disable the codepad Fire Alarm Report, program Locations 407 and 408 to 0 (refer to Section Codepad Fire Report). A codepad Fire Alarm transmits a Contact ID Event Code 110 to a base station receiver Codepad Medical Alarm An audible codepad Medical Alarm activates when a user presses  and  simultaneously. 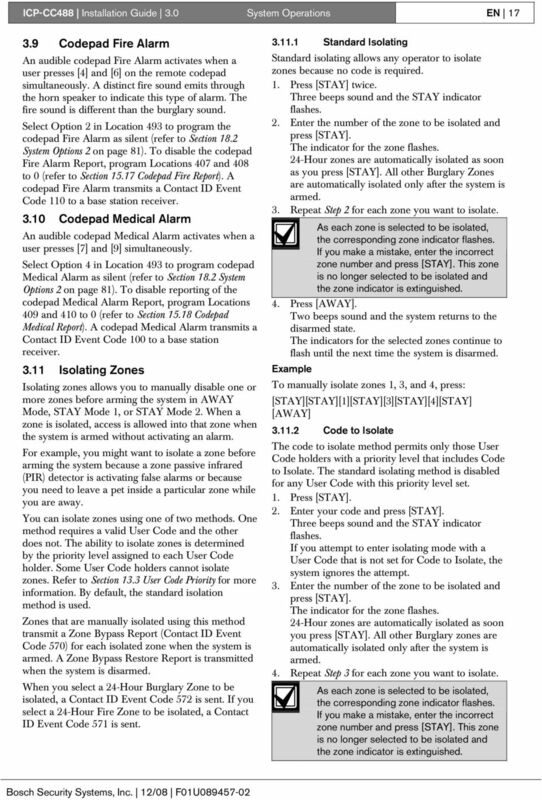 Select Option 4 in Location 493 to program codepad Medical Alarm as silent (refer to Section 18.2 System Options 2 on page 81). To disable reporting of the codepad Medical Alarm Report, program Locations 409 and 410 to 0 (refer to Section Codepad Medical Report). A codepad Medical Alarm transmits a Contact ID Event Code 100 to a base station receiver Isolating Zones Isolating zones allows you to manually disable one or more zones before arming the system in AWAY Mode, STAY Mode 1, or STAY Mode 2. When a zone is isolated, access is allowed into that zone when the system is armed without activating an alarm. For example, you might want to isolate a zone before arming the system because a zone passive infrared (PIR) detector is activating false alarms or because you need to leave a pet inside a particular zone while you are away. You can isolate zones using one of two methods. One method requires a valid User Code and the other does not. The ability to isolate zones is determined by the priority level assigned to each User Code holder. Some User Code holders cannot isolate zones. Refer to Section 13.3 User Code Priority for more information. By default, the standard isolation method is used. Zones that are manually isolated using this method transmit a Zone Bypass Report (Contact ID Event Code 570) for each isolated zone when the system is armed. A Zone Bypass Restore Report is transmitted when the system is disarmed. When you select a 24-Hour Burglary Zone to be isolated, a Contact ID Event Code 572 is sent. If you select a 24-Hour Fire Zone to be isolated, a Contact ID Event Code 571 is sent Standard Isolating Standard isolating allows any operator to isolate zones because no code is required. 1. Press [STAY] twice. Three beeps sound and the STAY indicator flashes. 2. Enter the number of the zone to be isolated and press [STAY]. The indicator for the zone flashes. 24-Hour zones are automatically isolated as soon as you press [STAY]. All other Burglary Zones are automatically isolated only after the system is armed. 3. Repeat Step 2 for each zone you want to isolate. As each zone is selected to be isolated, the corresponding zone indicator flashes. If you make a mistake, enter the incorrect zone number and press [STAY]. This zone is no longer selected to be isolated and the zone indicator is extinguished. 4. Press [AWAY]. Two beeps sound and the system returns to the disarmed state. The indicators for the selected zones continue to flash until the next time the system is disarmed. Example To manually isolate zones 1, 3, and 4, press: [STAY][STAY][STAY][STAY][STAY] [AWAY] Code to Isolate The code to isolate method permits only those User Code holders with a priority level that includes Code to Isolate. The standard isolating method is disabled for any User Code with this priority level set. 1. Press [STAY]. 2. Enter your code and press [STAY]. Three beeps sound and the STAY indicator flashes. If you attempt to enter isolating mode with a User Code that is not set for Code to Isolate, the system ignores the attempt. 3. Enter the number of the zone to be isolated and press [STAY]. The indicator for the zone flashes. 24-Hour zones are automatically isolated as soon you press [STAY]. All other Burglary zones are automatically isolated only after the system is armed. 4. Repeat Step 3 for each zone you want to isolate. As each zone is selected to be isolated, the corresponding zone indicator flashes. If you make a mistake, enter the incorrect zone number and press [STAY]. This zone is no longer selected to be isolated and the zone indicator is extinguished. 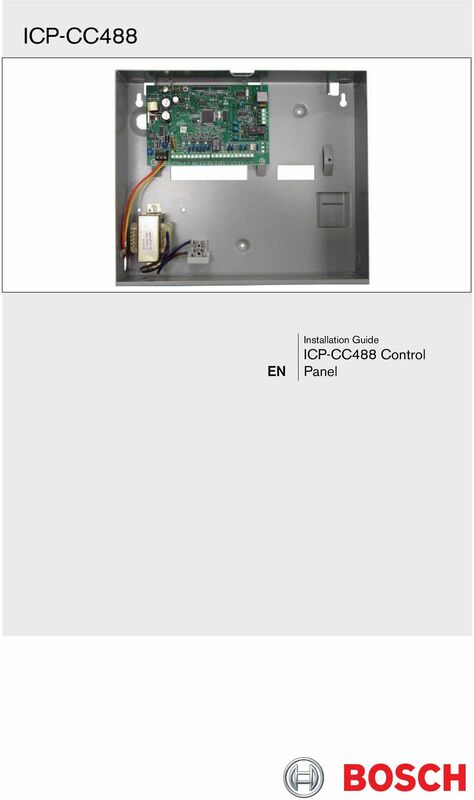 18 ICP-CC488 Installation Guide 3.0 System Operations EN Press [AWAY]. Two beeps sound and the system returns to the disarmed state. The indicators for the selected zones continue to flash until the next time the system is disarmed. 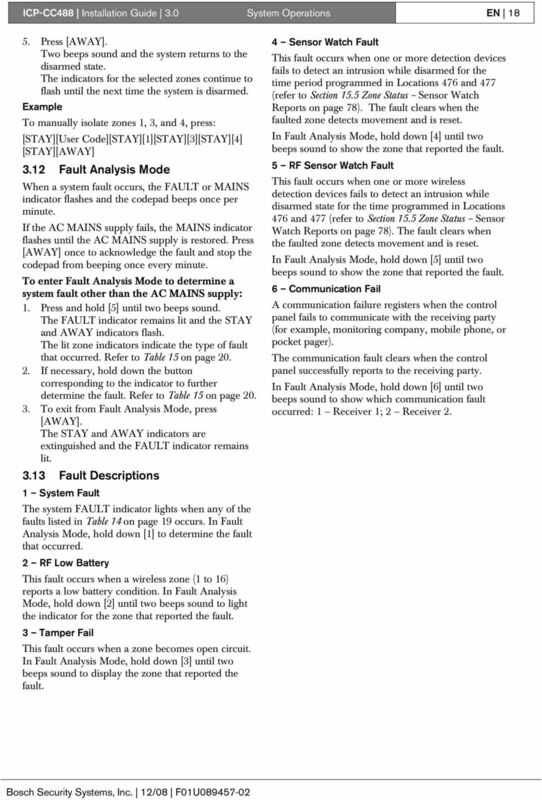 Example To manually isolate zones 1, 3, and 4, press: [STAY][User Code][STAY][STAY][STAY] [STAY][AWAY] 3.12 Fault Analysis Mode When a system fault occurs, the FAULT or MAINS indicator flashes and the codepad beeps once per minute. If the AC MAINS supply fails, the MAINS indicator flashes until the AC MAINS supply is restored. Press [AWAY] once to acknowledge the fault and stop the codepad from beeping once every minute. To enter Fault Analysis Mode to determine a system fault other than the AC MAINS supply: 1. Press and hold  until two beeps sound. The FAULT indicator remains lit and the STAY and AWAY indicators flash. The lit zone indicators indicate the type of fault that occurred. Refer to Table 15 on page If necessary, hold down the button corresponding to the indicator to further determine the fault. Refer to Table 15 on page To exit from Fault Analysis Mode, press [AWAY]. The STAY and AWAY indicators are extinguished and the FAULT indicator remains lit Fault Descriptions 1 System Fault The system FAULT indicator lights when any of the faults listed in Table 14 on page 19 occurs. In Fault Analysis Mode, hold down  to determine the fault that occurred. 2 RF Low Battery This fault occurs when a wireless zone (1 to 16) reports a low battery condition. In Fault Analysis Mode, hold down  until two beeps sound to light the indicator for the zone that reported the fault. 3 Tamper Fail This fault occurs when a zone becomes open circuit. In Fault Analysis Mode, hold down  until two beeps sound to display the zone that reported the fault. 4 Sensor Watch Fault This fault occurs when one or more detection devices fails to detect an intrusion while disarmed for the time period programmed in Locations 476 and 477 (refer to Section 15.5 Zone Status Sensor Watch Reports on page 78). The fault clears when the faulted zone detects movement and is reset. In Fault Analysis Mode, hold down  until two beeps sound to show the zone that reported the fault. 5 RF Sensor Watch Fault This fault occurs when one or more wireless detection devices fails to detect an intrusion while disarmed state for the time programmed in Locations 476 and 477 (refer to Section 15.5 Zone Status Sensor Watch Reports on page 78). The fault clears when the faulted zone detects movement and is reset. In Fault Analysis Mode, hold down  until two beeps sound to show the zone that reported the fault. 6 Communication Fail A communication failure registers when the control panel fails to communicate with the receiving party (for example, monitoring company, mobile phone, or pocket pager). The communication fault clears when the control panel successfully reports to the receiving party. In Fault Analysis Mode, hold down  until two beeps sound to show which communication fault occurred: 1 Receiver 1; 2 Receiver 2. 19 ICP-CC488 Installation Guide 3.0 System Operations EN 19 Table 14: System FAULT indicators Indicator Fault Description 1 Low battery This fault registers when the system detects a low capacity backup battery. The system automatically performs a battery test every 4 hours and every time you arm the system. 2 Date and time This fault registers when the system is powered down. The fault does not cause the FAULT indicator to light on the codepad unless automatic arming time is programmed. To program the date and time, refer to Section RF receiver fault This fault registers when the RF wireless receiver unit detects RF jamming, the RF wireless receiver is disconnected from the control panel or failed, or the RF receiver s cover tamper switch is activated. 4 Horn speaker This fault registers when the system detects the horn speaker is disconnected. This fault clears when the horn speaker is reconnected. This feature is enabled by selecting Option 2 in Location 492 (refer to Section 18.1 System Options 1). 5 Telephone line fault This fault registers when the system detects the telephone line is disconnected from the control panel. This feature is enabled by selecting Option 1 in Location 176 (refer to Section Telephone Line Fault Options). 6 EEPROM fail This fault registers when the system detects an internal checksum error. Contact your installer if this fault is displayed. 7 AUX Power Supply fail This fault occurs when the AUX Power Supply has failed. Contact your installer when this fault occurs. AC MAINS Failure An AC MAINS supply failure automatically flashes the MAINS indicator. If the AC MAINS supply is disconnected continuously for longer than 2 min, the remote codepad beeps the codepad buzzer once per min. If the control panel is programmed to report an AC MAINS failure to a base station receiver, an AC Fail Report (Contact ID Event Code 301) is transmitted. The MAINS indicator stops flashing when the AC MAINS supply is reconnected. When the AC MAINS supply is connected continuously for 2 min, the codepad stops the once per min beep and an AC Fail Restore Report is transmitted to the base station receiver. If the Enable AC Fail in 1 Hour option (1) is selected in Location 494 (refer to Section 18.3 System Options 3 on page 81), the codepad flashes the MAINS indicator when the AC MAINS supply is disconnected, but does not activate the dialer or the codepad buzzer unless the AC MAINS supply is disconnected continuously for 1 hour. 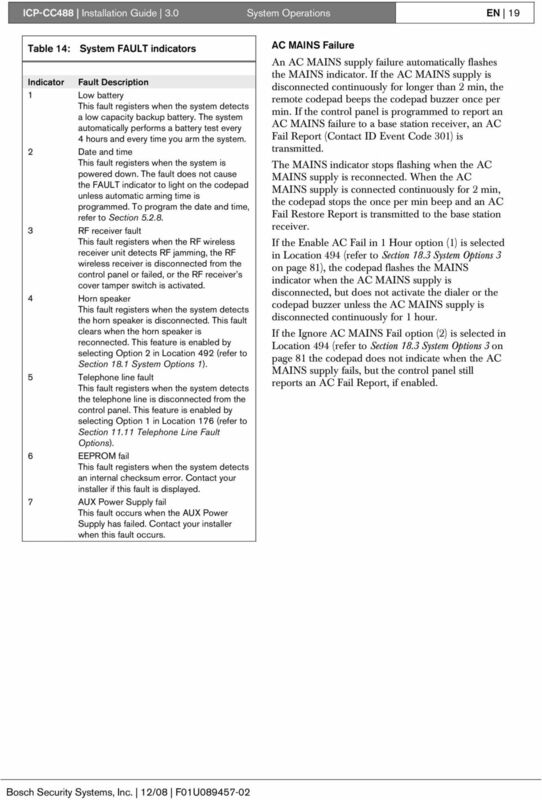 If the Ignore AC MAINS Fail option (2) is selected in Location 494 (refer to Section 18.3 System Options 3 on page 81 the codepad does not indicate when the AC MAINS supply fails, but the control panel still reports an AC Fail Report, if enabled. 20 ICP-CC488 Installation Guide 4.0 Remote Radio Transmitter Operations EN 20 Table 15: Fault Analysis Conditions Zone Indicator Fault Description Hold Down Button Zone Indicator Fault Condition 1 System fault 1 1 Low battery 2 Date and time 3 RF receiver jamming RF receiver tamper switch RF receiver communications fail 4 Horn speaker 5 Telephone line fail 6 EEPROM fail 7 AUX Power Supply fail 2 RF low battery 2 1 to 16 Zones 1 to 16 RF low battery 3 Zone Tamper Alarm 3 1 to 16 Zones 1 to 16 Tamper Alarm 4 Sensor watch fail 4 1 to 16 Zones 1 to 16 sensor watch fail 5 RF sensor watch 5 1 to 16 Zones 1 to 16 RF sensor watch fail 6 Communications fail 6 1 Receiver 1 fail 2 Receiver 2 fail 4.0 Remote Radio Transmitter Operations Figure 8: RF3334: 4-Button Keyfob Transmitter The ICP-CC488 Control Panel can be remotely operated using hand-held remote radio transmitters. 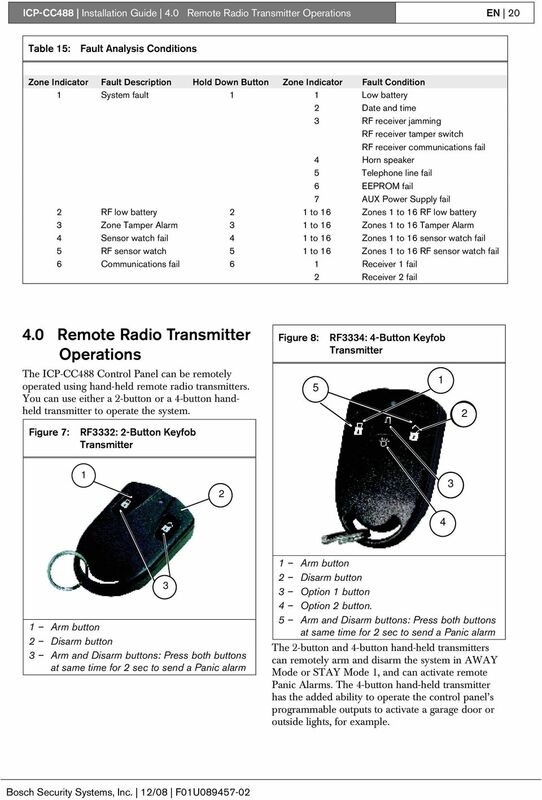 You can use either a 2-button or a 4-button handheld transmitter to operate the system Figure 7: RF3332: 2-Button Keyfob Transmitter Arm button 2 Disarm button 3 Arm and Disarm buttons: Press both buttons at same time for 2 sec to send a Panic alarm 3 1 Arm button 2 Disarm button 3 Option 1 button 4 Option 2 button. 5 Arm and Disarm buttons: Press both buttons at same time for 2 sec to send a Panic alarm The 2-button and 4-button hand-held transmitters can remotely arm and disarm the system in AWAY Mode or STAY Mode 1, and can activate remote Panic Alarms. The 4-button hand-held transmitter has the added ability to operate the control panel s programmable outputs to activate a garage door or outside lights, for example. !"#$%&"'()**+),-+)). ( /'0%1##1%&"'(21'$1#( ISSUE 1.40 MA8XXI 34&0(5167(410(877'(&'9#$:7:(;"
ICP-CC404 EN User s Guide ICP-CC404 Control Panel ICP-CC404 User's Guide Copyright Notice Copyright Notice Unless otherwise indicated, this publication is the copyright of Bosch Security Systems, Inc. Application Notes. 1.21 Partition Programming (PC1616/1832/1864 V4.2) Page 42. Panels: POWER SERIES (PC1616/1832/1864 V4. Application Notes 1.21 Partition Programming (PC1616/1832/1864 V4.2) Panels: POWER SERIES (PC1616/1832/1864 V4.2) Overview: The PC1616 supports 2 true partitions. The PC1832 supports 4 true partitions. TeleT eletek ek CA60 Plus Software Version 3.1 User Manual May 2000 CONTENTS 1. CA60Plus Keypad... 3 1.1. LED display... 3 1.2. Keys... 4 1.3. Combinations of Keys... 4 1.4. Audible Indication... 4 2.